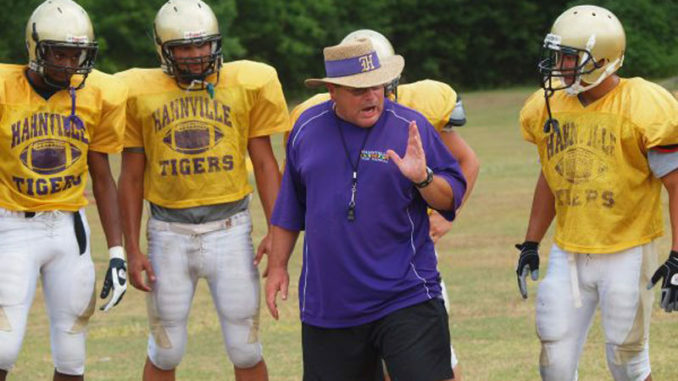 Lou Valdin works with his Hahnville players at practice during his head coaching tenure. Lou Valdin may not have been patrolling the sideline on Friday nights for the past few seasons, but the game of football never left his blood. The former longtime head coach of the Hahnville Tigers recently accepted an assistant coaching position with his alma mater Archbishop Shaw, where he’ll join the Eagles as linebackers coach. After taking the program’s helm in 1999, Valdin spent 15 years as Hahnville’s head coach, going 132-48 over a tenure highlighted by his 2003 state championship squad. He led the Tigers to seven district championships and 14 consecutive playoff appearances over that time, before he stepped down in 2013. He did so as the program’s all-time leader in coaching victories. He hasn’t strayed too far away from the game he loves, though. 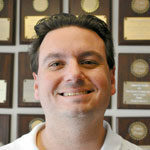 He’s been a mainstay on WWL radio’s Friday night prep football coverage as an analyst. He has also served as a Master Trainer for USA Football’s Heads Up program, which is aimed at making football safer at the youth and high school levels. Now, he returns to Shaw, where he graduated and where he was was the defensive coordinator of the Eagles’ 1987 state championship team under head coach Hank Tierney. That ’87 championship game was the last game, in fact, Valdin coached as part of the program before leaving to explore his head coaching aspirations. He said he’s had an eye on a return to coaching for awhile, but wanted to accrue the remaining years he needed within the St. Charles Parish system to retire. “I started looking around at that point, but I’ll tell you, I really didn’t have to look that far,” Valdin said, noting he reached out to Shaw principal George Hebert, a Shaw Class of 1985 alum whom Valdin coached, to express his interest. Another reason he felt drawn to Shaw was simply that he feels the program’s future is very bright under head coach Tommy Connors, 29, who was named Shaw head coach in 2017. While the program is in the midst of rebuilding, he said he believes it’s moving in the right direction under Connors and an administration that’s shown commitment to winning. He also quipped that he’s “the one old guy” on the staff. He does get reminded of his age from time to time by the players. But if he’s an old dog, he acknowledges he has to learn a few relatively new tricks — and he’s willing to. Shaw plays more zone defense than he was accustomed to in his years at Hahnville, and he says football has changed plenty over the relatively short four-year window he’s been away. And after observing it all from the outside for four years, he’s thrilled to be back in the middle of the action. Lou Valdin after earning his 100th head coaching victory.